Montero-Odasso M, Almeida QJ, Burhan AM, Camicioli R, Doyon J, Fraser S, Li K, Liu-Ambrose T, Middleton L, Muir-Hunter S, McIlroy W, Morais JA, Pieruccini-Faria F, Shoemaker K, Speechley M, Vasudev A, Zou GY, Berryman N, Lussier M, Vanderhaeghe L, Bherer L. SYNERGIC TRIAL (SYNchronizing Exercises, Remedies in GaIt and Cognition). A Multi-Centre Randomized Controlled Double Blind Trial to Improve Gait and Cognition in Mild Cognitive Impairment. BMC Geriatrics. 2018 Apr 16; 18(1):93. doi: 10.1186/s12877-018-0782-7. Fleet JL, Dixon SN, Kuwornu PJ, Dev VK, Montero-Odasso M, Burneo J, Garg AX. Gabapentin dose and the 30-day risk of altered mental status in older adults: A retrospective population-based study. PLoS One. 2018 Mar 14; 13(3):e0193134. Montero-Odasso M, Speechley M. Falls in Cognitively Impaired Older Adults: Implications for Risk Assessment and Prevention. Journal of the American Geriatrics Society. 2018. 66(2):367-375. Campos Freire Jr R, Pieruccini-Faria F, Montero-Odasso M. Does the Human Development Index affect gait performance of older adults? A systematic review.Experimental Gerontology. 2017; 102: 59-68. Paquet M, Cerasuolo JO, Thorburn V, Fridman S, Alsubaie R, Lopes RD, Cipriano LE, Salamone P, Melling CWJ, Khan AR, Sedeño L, Fang J, Drangova M, Montero-Odasso M, Mandzia J, Khaw AV, Racosta JM, Paturel J, Samoilov L, Stirling D, Balint B, Jaremek V, Koschinsky ML, Boffa MB, Summers K, Ibañez A, Mrkobrada M, Saposnik G, Kimpinski K, Whitehead SN, Sposato LA. Pathophysiology and Risk of Atrial Fibrillation Detected after Ischemic Stroke (PARADISE): A Translational, Integrated, and Transdisciplinary Approach. J Stroke Cerebrovasc Dis. 2017; 27 (3): 606-619. Annweiler C, Henni S, Walrand S, Montero-Odasso M, Duque G, Duval GT. Vitamin D and walking speed in older adults: Systematic review and meta-analysis. Maturitas. 2017; 106: 8-25. Sakurai R, Fujiwara Y, Yasunaga M, Suzuki H, Kanosue K, Montero-Odasso M, Ishii K. Association between Hypometabolism in the Supplementary Motor Area and Fear of Falling in Older Adults. Front Aging Neurosci. 2017; 9: 251. Montero-Odasso M, Pieruccini-Faria F, Bartha R, Black SE, Finger E, Freedman M, Greenberg B, Grimes DA, Hegele RA, Hudson C, Kleinstiver PW, Lang AE, Masellis M, McLaughlin PM, Munoz DP, Strother S, Swartz RH, Symons S, Tartaglia C, Zinman L, Strong MJ, ONDRI Investigators, and McIlroy W. Motor Phenotype in Neurodegenerative Disorders: Gait and Balance Platform Study Design Protocol for the Ontario Neurodegenerative Research Initiative (ONDRI). J Alzheimers Dis. 2017; 59 (2): 707-721. Montero-Odasso M, Sarquis-Adamson Y, Speechley M, Borrie MJ, Hachinski V, Wells J, Riccio PM, Schapira M, Sejdic E, Camicioli R, Bartha R, McIlroy WE, Muir-Hunter SW. Association of dual-task gait with incident dementia in Mild Cognitive Impairment: Results from the Gait and Brain Study. JAMA Neurology. 2017; 74 (7): 857-865. Sakurai R, Montero-Odasso M. Apolipoprotein E4 allele and gait performance in mild cognitive impairment: Results from the Gait and Brain Study. Journal of Gerontology: Medical Sciences (JGMS). 2017; 72(12): 1676-1682. Kueper JK, Speechley M, Lingum NR, Montero-Odasso M. Motor function and incident dementia: A systematic review and meta-analysis. Age and Ageing. 2017; 46(5):729-738. Cerasuolo JO, Montero-Odasso M, Ibanez A, Doocy S, Lip GYH, Sposato LA (2017).Decision-making interventions to stop the global atrial fibrillation-related stroke tsunami.Int J Stroke. 12(3): 222-228. Sakurai R, Ishii K, Yasunaga M, Takeuchi R, Murayama Y, Sakuma N, Sakata M, Oda K, Ishibashi K, Ishiwata K, Fujiwara Y, Montero-Odasso M. (2017) The neural substrate of gait and executive function relationship in elderly women: A PET study. Geriatr Gerontol Int. doi: 10.1111/ggi.12982. Farhan SM, Bartha R, Black SE, Corbett D, Finger E, Freedman M, Greenberg B, Grimes DA, Hegele RA, Hudson C, Kleinstiver PW, Lang AE, Masellis M, McIlroy WE, McLaughlin PM, Montero-Odasso M, Munoz DG, Munoz DP, Strother S, Swartz RH, Symons S, Tartaglia MC, Zinman L; ONDRI Investigators., Strong MJ. 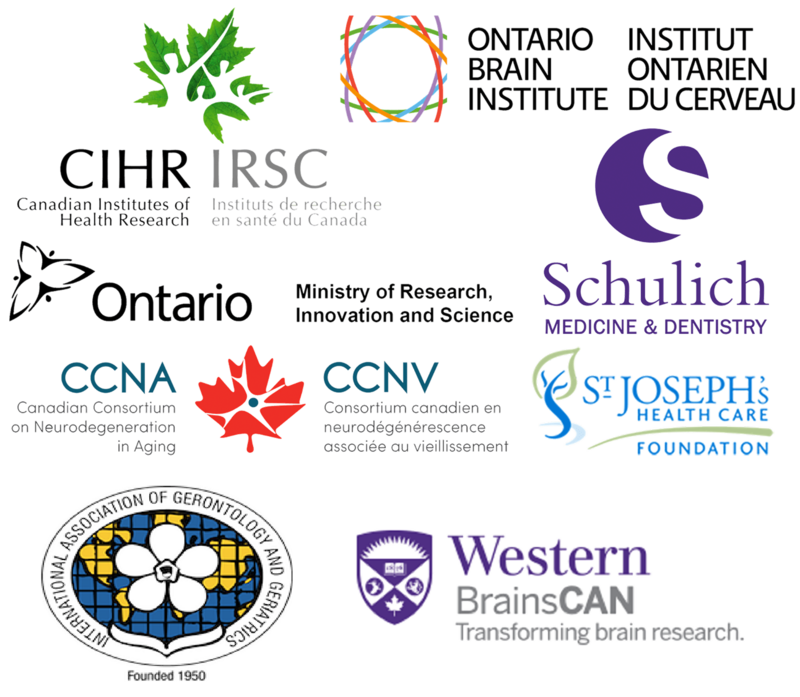 (2016) The Ontario Neurodegenerative Disease Research Initiative (ONDRI). Can J Neurol Sci. [Epub ahead of print] doi: 10.1017/cjn.2016.415. Montero-Odasso M, Hogan DB. (2016) Falls & Fall-related Injuries Special Interest Group: a Call to Action. Can Geriatr J. 19(4): 202-203. Montero-Odasso M, Sakurai R, Muir-Hunter SW, Islam A, Doherty T, Duque G, Crilly R. (2016). Serum Parathyroid hormone but not vitamin D is associated with impaired gait in community-dwelling older adults. Journal of the American Geriatrics Society. 64(12): 2606-2608. Sakurai R, Fujiwara Y, Yasunaga M, Suzuki H, Sakuma N, Imanaka K, Montero-Odasso M. (2016). Older adults with fear of falling show deficits in motor imagery of gait. The Journal of Nutrition Health and Aging. 1-6. Juma S, Taabazuing MM, Montero-Odasso M. (2016) Clinical Frailty Scale in an Acute Medicine Unit: a Simple Tool That Predicts Length of Stay. Can Geriatr J. 19(2): 34-9. Muir-Hunter SW, Fat GL, Mackenzie R, Wells J, Montero-Odasso M. (2016) Defining Rehabilitation Success in Older Adults with Dementia–Results from an Inpatient Geriatric Rehabilitation Unit. J Nutr Health Aging. 20(4): 439-45. Montero-Odasso M, Barnes B, Speechley M, Muir Hunter SW, Doherty TJ, Duque G, Gopaul K, Sposato LA, Casas-Herrero A, Borrie MJ, Camicioli R, Wells JL. (2016) Disentangling Cognitive-Frailty: Results From the Gait and Brain Study. J Gerontol A Biol Sci Med Sci. 71(11): 1476-1482. Muir-Hunter SW, Montero-Odasso M. (2016) Gait Cost of Using a Mobility Aid in Older Adults with Alzheimer’s Disease. J Am Geriatr Soc. 64(2): 437-8. Montero-Odasso M. (2016) Gait as a biomarker of cognitive impairment and dementia syndromes. Quo vadis? Eur J Neurol. 23(3): 437-8. Muir-Hunter SW, Graham L, Montero Odasso M. (2015) Reliability of the Berg Balance Scale as a Clinical Measure of Balance in Community-Dwelling Older Adults with Mild to Moderate Alzheimer Disease: A Pilot Study. Physiother Can. 67(3): 255-62. Burhan AM, Subramanian P, Pallaveshi L, Barnes B, Montero-Odasso M. (2015) Modulation of the Left Prefrontal Cortex with High Frequency Repetitive Transcranial Magnetic Stimulation Facilitates Gait in Multiple Sclerosis. M.Case Rep Neurol Med. 251829. McKinnon NB, Montero-Odasso M, Doherty TJ. (2015) Motor unit loss is accompanied by decreased peak muscle power in the lower limb of older adults. Exp Gerontol. 70: 111-8. Montero-Odasso M, Herer L, Camicioli R. (2015) Mobility and Cognition in Seniors. Report from the Institute of Aging (CIHR) Mobility and cognition Workshop. Can J Geriatr. 14: 125-136. Fogarty JN, Murphy KJ, McFarlane B, Montero-Odasso M, Wells J, Troyer AK, Trinh D, Gutmanis I, Hansen KT. (2015) Taoist Tai Chi® and Memory Intervention for Individuals with Mild cognitive Impairment. J Aging Phys Act. 24(2): 169-80. Beauchet O, Celle S, Roche F, Bartha R, Montero-Odasso M, Allali G, Annweiler C. “Blood pressure levels and brain volume reduction: a systematic review and meta-analysis.” J Hypertens. 2013; 31(8):1502-1516. Annweiler C, Beauchet O, Bartha R, Graffe A, Milea D, Montero-Odasso M.
“Association Between Serum 25-Hydroxyvitamin D Concentration and Optic Chiasm Volume.” J Am Geriatr Soc. 2013; 61(6):1026-1028. Annweiler C, Beauchet O, Bartha R, Wells JL, Borrie MJ, Hachinski V, Montero-Odasso M. “Motor cortex and gait in mild cognitive impairment: a magnetic resonance spectroscopy and volumetric imaging study.” Brain. 2013; 136(Pt 3):859-71. Annweiler C, Muir SW, Nabeel S, Gopaul K, Beauchet O, Montero-Odasso M.
“Higher serum vitamin D concentration is associated with better balance in older adults with supra-optimal vitamin D status.” J Am Geriatr Soc. 2013 Jan;61(1):163-5. Annweiler C, Montero-Odasso M, Hachinski V, Seshadri S, Bartha R, Beauchet O. “Vitamin D concentration and lateral cerebral ventricle volume in older adults.” Mol Nutr Food Res. 2013;57(2):267-76. Annweiler C, Beauchet O, Bartha R, Montero-Odasso M. “Slow gait in MCI is associated with ventricular enlargement: results from the Gait and Brain Study.” J Neural Transm. 2013;120(7):1083-92. Montero-Odasso M, Verghese J, Beauchet O, Hausdorff JM. “Gait and cognition: a complementary approach to understanding brain function and the risk of falling.” J Am Geriatr Soc. 2012 Nov;60(11):2127-36. Montero-Odasso M, Annweiler C, Hachinski V, Islam A, Toma N, Vasudev A. “Vascular burden predicts gait, mood, and executive function disturbances in older adults with mild cognitive impairment: results from the gait and brain study.” J Am Geriatr Soc. 2012 ;60(10):1988-90. Annweiler C, Beauchet O, Celle S, Roche F, Annweiler T, Allali G, Bartha R, Montero-Odasso M; WALK Team (Working group Angers-London for Knowledge). “Contribution of brain imaging to the understanding of gait disorders in Alzheimer’s disease: a systematic review.” Am J Alzheimers Dis Other Demen. 2012 Sep;27(6):371-80. Annweiler C, Montero-Odasso M “Vascular burden as a substrate for higher-level gait disorders in older adults. A review of brain mapping literature.” Panminerva Med. 2012 Sep;54(3):189-204. Annweiler C, Montero-Odasso M, Bartha R, Beauchet O. “Nutrient biomarker patterns, cognitive function, and MRI measures of brain aging.” Neurology. 2012 Apr 17;78(16):1281-2. Annweiler C, Montero-Odasso M, Muir SW, Beauchet O.”Vitamin D and Brain Imaging in the Elderly: Should we Expect Some Lesions Specifically Related to Hypovitaminosis D?” Open Neuroimag J. 2012;6:16-8. Muir SW, Gopaul K, Montero Odasso M. “The role of cognitive impairment in fall risk among older adults: a systematic review and meta-analysis.” Age Ageing. 2012 May;41(3):299-308. Beauchet O, Annweiler C, Montero-Odasso M, Fantino B, Herrmann FR, Allali G. “Gait control: a specific subdomain of executive function?” J Neuroeng Rehabil. 2012 Feb 9;9:12. Montero-Odasso M, Muir SW, Speechley M. “Dual-task complexity affects gait in people with mild cognitive impairment: the interplay between gait variability, dual tasking, and risk of falls.” Arch Phys Med Rehabil. 2012 Feb;93(2):293-9. Muir SW, Montero-Odasso M. “Effect of vitamin D supplementation on muscle strength, gait and balance in older adults: a systematic review and meta-analysis.” J Am Geriatr Soc. 2011 Dec;59(12):2291-300. DeCaria JE, Montero-Odasso M, Wolfe D, Chesworth BM, Petrella RJ. “The effect of intra-articular hyaluronic acid treatment on gait velocity in older knee osteoarthritis patients: a randomized, controlled study.” Arch Gerontol Geriatr. 2012 Sep-Oct;55(2):310-5. Muir SW, Speechley M, Wells J, Borrie M, Gopaul K, Montero-Odasso M.
“Gait assessment in mild cognitive impairment and Alzheimer’s disease: the effect of dual-task challenges across the cognitive spectrum.” Gait Posture. 2012 Jan;35(1):96-100. Beauchet O, Hélard L, Montero-Odasso M, de Decker L, Berrut G, Annweiler C.”Hypovitaminosis D in geriatric inpatients: a marker of severity of chronic diseases.” Aging Clin Exp Res. 2012 Apr;24(2):188-92. Decaria J, Petrella R, Petrella R, Wolfe D, Chesworth BM, Montero-Odasso M. “Effect of intra-articular hyaluronic acid on gait variability in older adults with knee osteoarthritis.” J Am Geriatr Soc. 2011 May;59(5):949-51. Beauchet O, Fantino B, Allali G, Muir SW, Montero-Odasso M, Annweiler C.
“Timed Up and Go test and risk of falls in older adults: a systematic review.” J Nutr Health Aging. 2011 Dec;15(10):933-8. Montero-Odasso M, Muir SW, Gopaul K, Annweiler C, Beauchet O. “Gait velocity versus the timed up and go test: which one to use for the prediction of falls and other adverse health outcomes in primary care?” J Am Geriatr Soc. 2011 Nov;59(11):2191-2; author reply 2192-3. Montero-Odasso M, Muir SW, Hall M, Doherty TJ, Kloseck M, Beauchet O, Speechley M. “Gait variability is associated with frailty in community-dwelling older adults.” J Gerontol A Biol Sci Med Sci. 2011 May;66(5):568-76. Wells M, Jacques R, Montero Odasso M. “Thalamic infarct presenting as catastrophice life-threatening event in an older adult.” Aging Clin Exp Res. 2010 Sept 30. Annweiler C, Schott AM, Montero-Odasso M, Berrut G, Fantino B, Herrmann FR, Beauchet O. “Cross-sectional association between serum vitamin D concentration and walking speed measured at usual and fast pace among older women: The EPIDOS study.” J Bone Miner Res. 2010 Mar 4. Montero-Odasso M, Bergman H, Phillips NA, Wong CH, Sourial N, Chertkow H. “Dual-tasking and gait in people with Mild Cognitive Impairment. The effect of working memory.” BMC Geriatr. 2009 Sep 1;9(1):41. Montero-Odasso M, Wells J, Borrie M. “Can Cognitive Enhancers Reduce the Risk Of Falls In People With Dementia? An Open Label Study with Controls.” Journal of the American Geriatrics Society. 2009;57:1359-1360. Telleir C, Monette J, Gold S, Montero-Odasso M, Le Crugel P, Papadopoulous G. “Fear of falling and Orthostatic hypotension: a case series from a geriatric outpatient clinic.” Canadian Journal of Geriatrics. 2008;11(2):99-103. Montero-Odasso M. “Evaluación Perioperatoria en Ancianos.” NEXO Revista del Hospital Italiano de Buenos Aires. 1999; 19 (1): 20-26. Montero-Odasso M. “Caidas en el anciano: Un gigante de la geriatria.” NEXO Revista del Hospital Italiano de Buenos Aires. 1999; 19(3):75-81. Montero-Odasso M, Pitteri C, Kaplan R et al. “Evaluación Multidimensional en Ancianos: ¿un instrumento útil a la consulta?” Rev. Arg. de Geriatría. 1996; 16:223- 228.